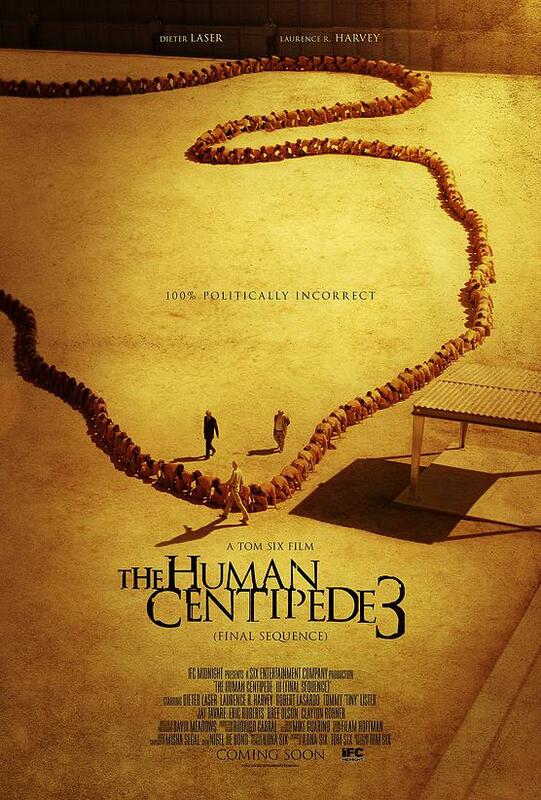 We’ve Got Your First Peek At ‘The Human Centipede 3’ Poster and Trailer!!! ‘The Human Centipede‘ is back and being called its Final Sequence, we’ve got your first look at the poster. The newest film leaves the dream of a 12 person centipede in the dust as this script promises one made of 500 people. Of course it’s going to be “100% Politically Incorrect’! The project comes from the same writer and director that began the sick journey, Tom Six. Eric Roberts, Dieter Laser, Laurence R. Harvey and Bree Olson are lending their talents to the third installment.The film opens May 22 in US theatres and for VOD. ‘The Human Centipede: The Complete Sequence’ Is Coming To Disc For First Time Ever!!! This entry was posted on Tuesday, April 28th, 2015 at 12:44 pm	and is filed under Film, News. You can follow any responses to this entry through the RSS 2.0 feed. You can skip to the end and leave a response. Pinging is currently not allowed. « WWE: Extreme Rules 4/26/15 Recap! How did he know about the money? And how did he know that Tony Cisco got popped? We didn't find out about it till this morning.